Both cottages are equipped similarly, except the wood stove in the dacha. Electric heating in the cabin., And in his absence, in the dacha. Wifi everywhere. Fridge, electric hob crossfire, kettle and coffee maker, pots and pans, microwave, toaster; very warm duvets. Both cottages are arranged side by side, but not vis-à-vis to preserve the privacy of residents. Two mini-cabins chalets artist with a warm and authentic atmosphere: I have designed for the kid in everyone. You can book one or the other of the two cottages, each accommodating a single person or a couple without children. Thus, two couples can meet friends, knowing that the price is for a single cottage. You will find something to dream in a simple, cozy, facing the forest, facing the essentials. Four corners to a beneficial room: sitting-sleeping with trundle new, the 2nd bed slides easily and rises up to the first, giving a bed 180x190, thick and very comfortable with new mattresses. Corner bathroom with shower, new health, kitchen, 2 electric hob rings, fridge, kettle, toaster, microwave; dining area, rest everything is designed for a different and comfortable, a real disconnect, but there is wifi-internet! 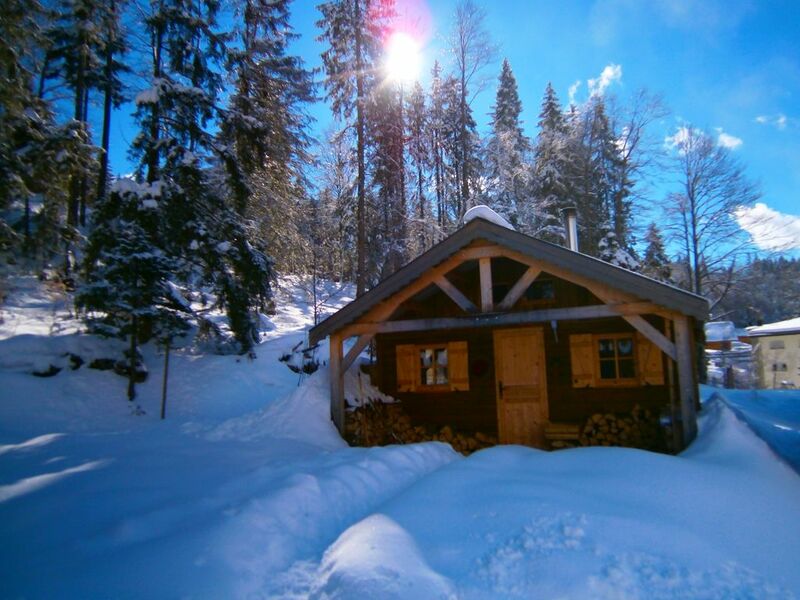 Situated right in the quiet yet start walking, ski alpine skiing, Nordic trails you can walk to. You will leave with a stay at the dacha or cabin rested amazed by the immediate environment, closer or more distant refreshed (es) with holiday spirit as the body. Lausanne and Geneva are 1 hour, golf, dog sled rides, casino and spa 30 minutes, shops, restaurants, cinema Rousses, 3kms, shuttles there, little red train to go to the edge of Lake Geneva, Switzerland, with a disconcerting way of beauty. The bathroom has a corner shower with seat. I can make available books from my personal library. -An exhibits a prime location in the rural mountain of Jura, about 45 minutes of Geneva airport. Host was welcoming , very helpful and friendly, Simply with her, you will feel at home. There, we enjoyed charming nature, clear sky. Great place to relax and get away from the bustle of everyday life. Linen was very clean, crisp and white and amazing towels. Wifi was a good speed and fresh flowers tea, coffee and breakfast was provided in the room. We had booked it for one night only and wished we could have been there longer. There were so many personal touches that made this visit an experience to remember. Definitely going back to this enchanted place. Special appreciation for madam NICOLE ZORN. It was marvellous for me too to welcome you both. I hope you felt very well for several days after your journey at the datcha. There will be champagne next time! Best regards and thank you very muche for your sympathetic advice! - An exhibits a prime location in the rural mountain of Jura, about 45 minutes of Geneva airport. Un vrai ptit nid d'amoureux ! Je suis enchantée que votre séjour vous ait comblés et je vous suis reconnaissante d'avoir pris le temps de l'exprimer ainsi. Merci beaucoup. Nous avons passer un très bon séjour dans se petit chalet certe rustique mais tellement sympathique.